Do you want this year’s camping trip to be a happy experience? 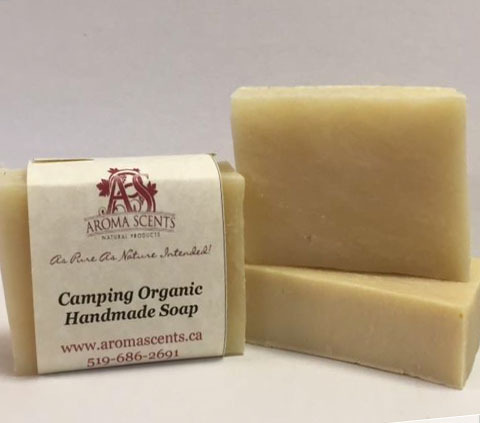 Then you will definitely love our simple, all-in-one Camping Soap! Use it head to toe to keep yourself a happy, clean camper. It is a totally vegan soap that is natural, organic and Earth friendly. So easy to use and long lasting. Made with a blend of Coconut Oil, Palm Oil and Shea Butter, we add natural essential oils that do not attract insects. This is a hydrating soap with a fantastic lather that won’t strip your skin of its natural oils!. Your skin will feel totally clean. As a result this soap is a perfect balance for the environment and your body.